Abraham Associates Ltd were commissioned to design and develop a complete new range of woodchipping machines for an ambitious arboricultural specialist with many years experience supplying these machines throughout the UK. A close working relationship was established to incorporate this wealth of experience and to overcome most of the known problems associated with these machines. The aim was to create the most robust and highest performing quality machines on the market. An initial four machines were designed in close succession building on as many common parts as possible. These were, 6 inch wheeled, 6 inch tracked, 8 inch wheeled and 8 inch tracked. The machine dimensions refer to the material input hopper throat defining the maximum material height dimension that can be fed into the machine. Other variants of these were developed to exploit various market opportunities. Each machine was designed from the ground up addressing all the design enhancements to produce a premium machine. One of the primary design requirements were those to meet Health and Safety law. Woodchipping machines by their very nature are extremely dangerous to users and bystanders if not strictly managed by trained operators. Design had to be intrinsically safe in the event of catastrophic failure. Interlocks were also designed into all points of access to prevent injury when the machine was in operation. The bulk of these machines are fabricated laser cut steel assemblies. Some are very complex and demanding to fabricate so a lot of development went into these with close collaboration with fabrication suppliers. Manufacturing a product in this way avoids significant capital expenditure as it requires little or no tooling (apart from production jigs and fixtures) enabling changes, continuous improvement and customisation. Tooling was required for fluid tanks and some specialised elastomer buffers. 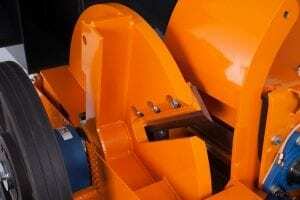 Material selection and manufacturing process specification was critical for all drive and cutting components. OEM components and equipment on these machines included, hydraulics, diesel engines, bearings, power transmission, PLC control system for feed control, engine and service management, gas springs, Morse controls, trailer components (hitch and axle) and the many fasteners. Wheeled machines created the need for road worthiness requiring type approval and were designed to DVSA (Driver and Vehicle Standards Agency – formerly VOSA) requirements. All machines required a VIN (Vehicle Identification Number) plate. This was linked to a product serial number applied and managed during manufacture. Managing a product of this complexity in a product range on a CAD system required careful and detailed management of the large amount of data. Solidworks handles this very well but key to this is having the correct specification computer hardware, data management and storage facilities. 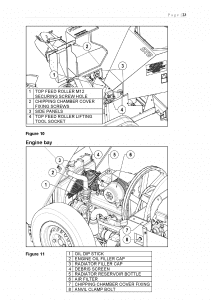 User manuals were created for all machines using Solidworks CAD data and Solidworks composer. 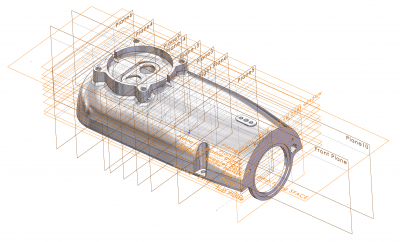 Some main advantages of this is that the CAD data is not complicated to generate documentation images and the product CAD data is parametrically linked to the manual and illustration data saving a huge amount of time and effort when changes and updates are required. Composer can use 3D data from any CAD system. This market leading woodchipping machine range has been the springboard for this company to rapidly grow from market entry to a dominant position in the woodchipping industry within 5 years.